This year’s Angling Trust Ladies National Championship saw forty three (43) anglers battle it out at Packington Fisheries, Coventry. The England International Ladies were very strong on the day and filled the top six places with Sarah Taylor just missing out on a place in the top six by a mere 50g to finish in seventh place overall on the day. 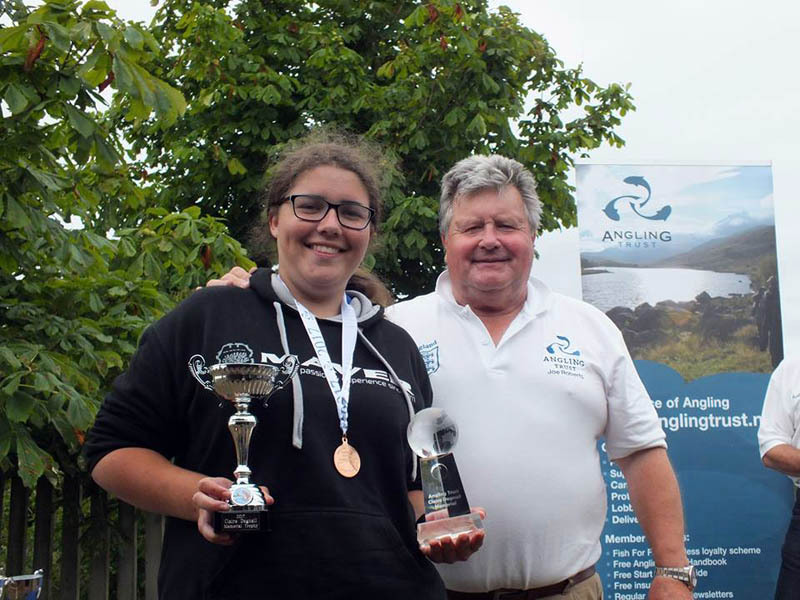 That said, despite missing out on a top individual place, Sarah enjoyed an extremely successful event overall winning the annual Claire Dagnall Memorial trophy on the day and also received the Angling Trust’s ‘Upcoming Angler’ award! Sarah also managed a third place finish in the team event with Lindholme Ladies. Below, Sarah reflects on a very successful 2017 Ladies National Championship event. “Before the draw I wanted to be on Little Geary’s as it is more suited to my style of fishing with it being mostly F1’s. At the draw, I drew peg 19 on Little Geary’s, so I was pretty happy. I went to speak with Daniel Tresigne to get some valuable information and was instructed to approach the match in exactly the same as I had in practice. However, on the day, I also decided to primer two margin swims“. “Upon arriving at my peg I discovered I was in a corner with the wind pushing into it so was confident of catching a few. I set up a feeder chuck to the island, a long shallow pole line at 13m, a short to-hand line (for catching roach if it was hard) and two margin swims to my left and right“. “To cut a long story short, I had a frustrating day trying to get a run of fish going, but with little success. I managed 19.050kg come the end of the five hours. Sandra Scotthorne to my left won the match with 39kg and Emma Pickering finished in second place with 34kg a couple of pegs down. Julie Abbott finished in third place pegged a few pegs to my right with 24kg. They all fished incredibly well so a big congratulations to them“. “At the results, my 19kg was good enough for seventh place on the day, just missing out on a top six finish by fifty grams. Unfortunately, this meant I just missed out on qualifying for the ladies Fish O Mania. However, I did manage to win the Claire Dagnall Memorial for the highest placing U21. I have heard lots of lovely stories about Claire and how she was an incredible angler and person, so I am genuinely honoured to have won this“. “I was also awarded the Upcoming Angler award by the Angling Trust, which was a complete shock“! “Finally, on a team front, I managed to finish in third place with the Lindholme Ladies team comprised of Charlotte Gore, Kayleigh Smith and Leanne Jane Knott“. “I would like to thank the Angling Trust for organising the event and congratulations to all the winners. A big thank you also to Danny Tresigne for the help and the information he offered on the day. A big thank you also to Maver UK for their continuous support and faith in me“.